Hello Friends! It's no secret that I absolutely adore the images from Power Poppy. This week, they are sharing sneak peeks of their Holiday Designs. There are some beautiful things going on over there. Take a moment to buzz on over. You will not be disappointed. This time I printed the image onto smooth white card stock and colored it with Spectrum Noir colored pencils. I love how effortlessly they blend. I used no Gamsol and no blending pencil, instead, I used the pencils themselves, including the white pencil, to add highlights. LOVE this technique! It makes coloring on the go sooooo much easier. No bothersome bottles of blending solution to fiddle with...just my images and my colored pencils. To finish the image, I outlined it with a pale blue Copic marker. After I completed the coloring, I added my signature sparkle with a clear Wink of Stella glitter pen. Then, I decided to add some seed beads to the center of the flower for interest and texture. I'm pleased with how all that turned out. I adhered the beads with Glossy Accents. The card design is super simple. I find that I'm liking that more and more these days. The finishing touch was a few Pretty Pink Posh sequins to highlight the greeting. 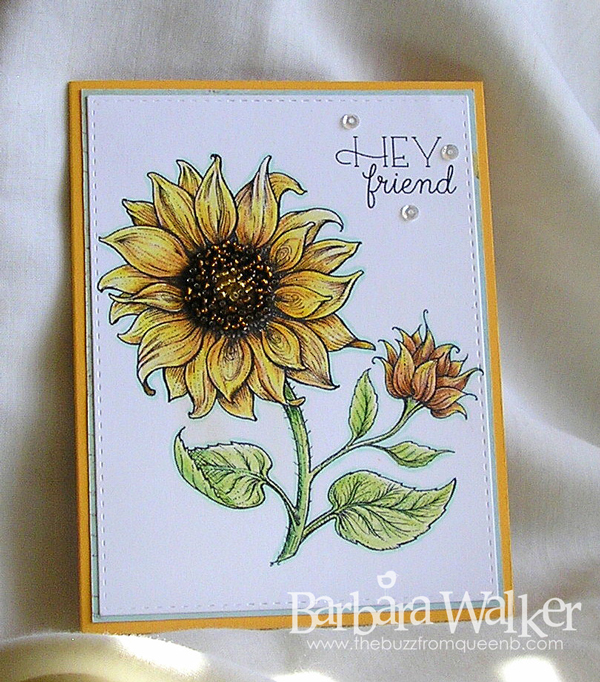 WHICH, by the way is from a different Power Poppy digital image set called Easy, Breezy Coneflower. I love being able to use the sentiments on any image because they come as a separate file. VERY cool! That's all I've got for today. I'm still not feeling 100% yet. Soooo...off I go to rest awhile. Thanks for stopping by today! I appreciate it. Wow, Barb, this is gorgeous!! I love sunflowers and this image is so pretty. Both of the cards you made with it are lovely, and I have no doubt that your friend will treasure this one. The seed beads really add a lot to it, but your coloring could definitely stand on its own...with the WOS, of course. ;P It's quite impressive that those pencils don't need any blending solution, which I guess also speaks to your coloring ability to make the flower look so real without having to work too hard at it. Just beautiful! Hope you are feeling well by tomorrow. Oh my gosh, Barb....this is glorious! What a beautiful card. So happy you are enjoying just coloring with pencils and not messing with the blending solutions when you don't have to. It's working for you as we can clearly see on this beauty. Adore that you added the seed beads to the center. Add a bit of texture and shine. You are so clever. I do hope you feel back to 100% very soon. Thanks for sharing! I love these posts of yours! :) Hugs! Oh my Barb!! 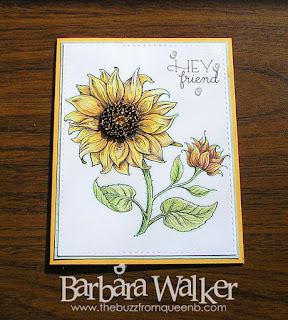 Your sunflower is STUNNING!! I LOVE the look of the pencils and the fabulous texture and depth the beads add in the center!! GORGEOUS!! Oh, Barb, I'm sorry you still aren't feeling well and am praying that you will soon! 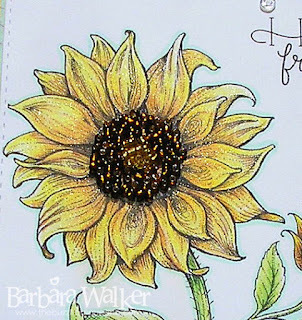 What an absolute delight to see this PP sunflower (one of my favorites), and I just love your pencil coloring - it's exquisite! And what a brilliant idea to use seed beads for the center! 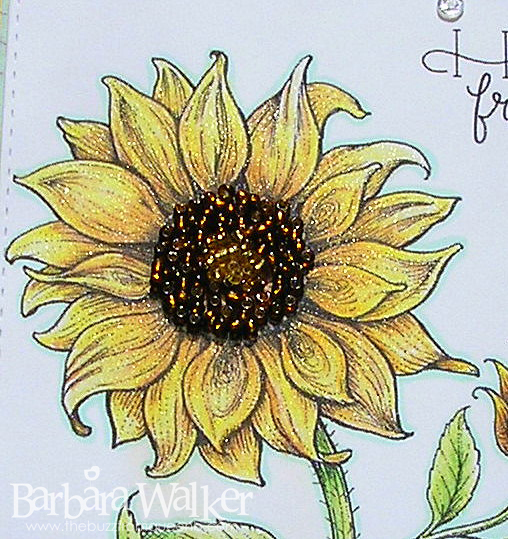 It's gorgeous and really adds the texture that sunflower really have (we grow them here in South Florida, and the centers are amazing)! I'm with you about trying to keep cards simple, and this is perfect with this charming sentiment with the sequins to highlight it! Tender hugs, and feel better! 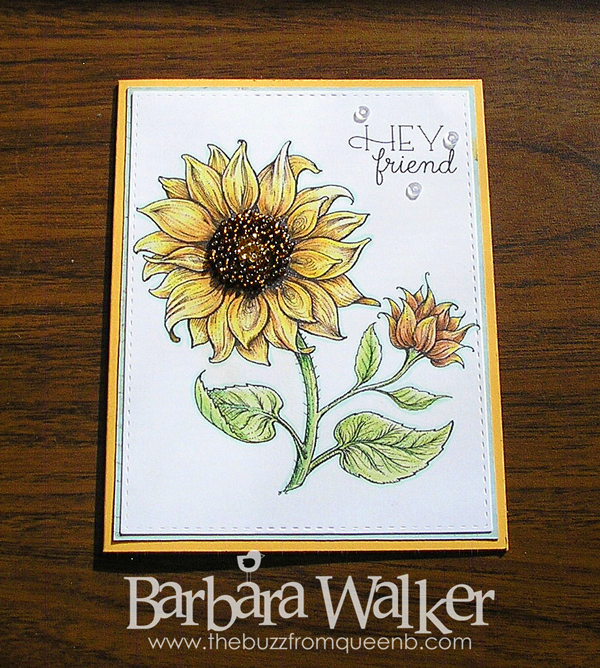 My word, Barb....you made that sunflower positively s-i-n-g. Your shading is incredible and I love the seed beads in the center of your flower....I'm with Tosh....this is simply stunning. 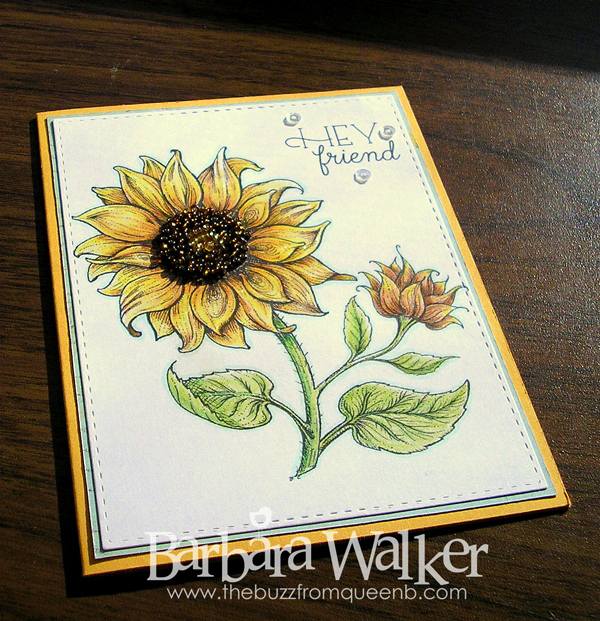 Your crisp and clean card design really make your beautifully colored bloom shine! :) Hope you are feeling better soon!